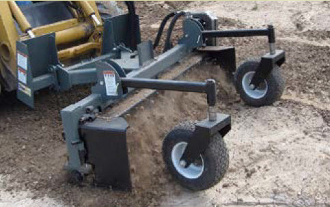 Responsive and reliable, the 20-Series is designed for Skid Steers up to 65 HP. Features a #80 chain drive, dual flip-up gauge wheels, flip-up side shields and an all-welded frame constructed of 3 x 4 x 1/4 tubing. Also standard are reliable gauge wheels (16 x 6.50-8) mounted to 4-bolt hubs and a “Flex & Float” System offering the operator flexibilty to choose maximum down pressure or float position for site prep.